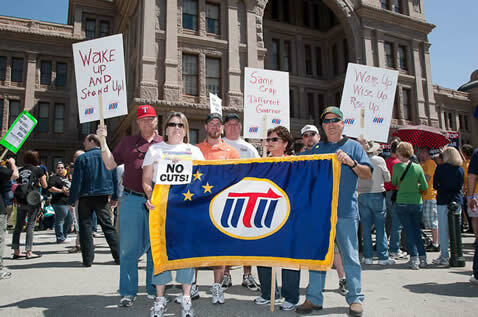 The Texas State Employees Union/ CWA & Texas Forward Lobby day was well represented by UTU on April 6th. (Right to Left) Retired member Ernest Brister of Hillsboro, Tina Adams VLR of Local 331, Chris Alston V.G.C. of Local 1886, Charlie Jones L.R.of Local 1886, Pam Neal Office Manager of G.O.393, Reggie Singleton LC of Local 331, and Andy Carrola of Tavormina & Young came to Austin that day to march, rally, and lobby the legislators. These men and women also met with Assistant State Director Kamron Saunders and State Legislative Director Connie English on the south steps of the Capitol to participate in the rally. This rally was very well attended with over 6,000 participants from all over Texas. Special recognition goes to Tina Adams and Pam Neal who have also attended two other rallies here in Austin. Both ladies attended the Save the American Dream Rally on Saturday, February 26th and the Save Texas Schools Rally on Saturday, March 12th. UTU has been well represented and I am very grateful for their participation.